Four children and their elderly great-grandparents were swept away in a van while trying to escape rising flood waters in Houston on Sunday, a family member told BuzzFeed News. 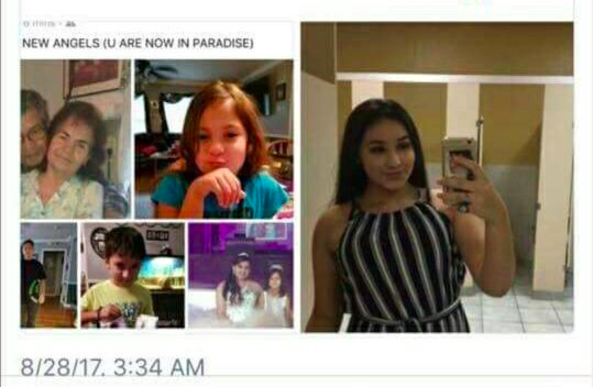 The four children and their great-grandparents were trying to make the journey from their home to another family member's home when they were caught in flood waters at the intersection of Green River Drive and John Ralston Road, Ashley Hiser-Jackson, a California-based relative, told BuzzFeed News. The four children were identified by Hiser-Jackson as Devy Saldivar, 16, Dominic Saldivar, 14, Daisy Saldivar, 6, and Xavier Saldivar, 8. Their great-grandparents were identified as Manuel and Belia Saldavar, 84 and 81 years old. Hiser-Jackson has been in touch with her family in Houston, she said, who told her that one of the elderly couple's sons was on his way to meet them and take them to his house when they were swept away. Local TV station KHOU 11 reported that a man driving the van was able to escape before it sank by holding onto a tree branch. Witnesses told the station that emergency crews in the area were not able to reach the van in time to rescue the six inside. Hiser-Jackson said the rest of her family members in Texas are evacuating their homes and heading to a shelter in the Houston area. The Harris County Institute of Forensic Science told BuzzFeed News they can confirm six deaths in the area since Saturday, but that those bodies have not been identified and that they cannot yet confirm that they are storm-related. Local authorities did not immediately respond to requests for comment and have not yet confirmed the incident. – Tasneem Nashrulla contributed to this report.